Objective To clinically evaluate education to improve eating behaviour and skeletal loading exercise in male cyclists at risk of poor bone health and impaired performance due to relative energy deficiency in sports. Methods Early race season, 50 competitive male road cyclists were matched, in pairs, based on Z-scores for lumbar spine bone mineral density (BMD). One member of each pair was randomly allocated to receive educational interventions. After the season, 45 cyclists returned for dual-energy X-ray absorptiometry scans and blood tests. Least significant change was applied to identify clinically meaningful BMD changes. Cyclists completed a follow-up sport-specific questionnaire and clinical interview to ascertain adherence to the interventions. Results The questionnaire and clinical interview categorised behaviour changes as positive, negative or unchanged. Positive changes in nutrition and skeletal loading were associated with a statistically significant increase of 2.0% in lumbar spine BMD; 7 of 11 cyclists’ increases were clinically meaningful. Negative changes in both behaviours were associated with a significant decrease of 2.7% in lumbar BMD; all nine cyclists’ BMD decreases were clinically meaningful. Regarding performance, taking account of functional threshold power, changes in nutritional behaviour accounted for gains or losses of 95 British Cycling racing points. Cyclists reported psychological barriers to change in behaviours, specifically fear of negatively impacting performance. Conclusions Educational nutritional and skeletal loading interventions can improve bone health, well-being and race performance in male cyclists over a 6-month race season. Psychological support may be required to help some athletes change behaviour. What are the key new findings of this study? Changing both nutrition and skeletal loading exercises over a race season resulted in significant changes in lumbar spine bone mineral density. Based on British Cycling points won over the season, reducing energy availability was associated with negative cycling performance; increasing energy availability was associated with superior cycling performance. For cyclists to change their behaviours to achieve better health and performance, psychological barriers (fear of performance decrements) were a greater impediment than physical factors (eg time). How might this study impact clinical practice in the future? Athletes at risk of relative energy deficiency in sports (RED-S), including male athletes, should be assessed for low energy availability. Our sport-specific energy availability questionnaire combined with clinical interview (SEAQ-I) provides a practical, effective clinical tool to identify and manage cyclists at risk of RED-S.
We suggest the approaches in this study can be applied more broadly to provide sports-specific/dance-specific educational support on nutritional and exercise strategies to improve health and performance. Our findings will be made available to athletes, coaches, parents and healthcare professionals through educational online resources on RED-S, such as the British Association of Sport and Exercise Medicine, www.Health4Performance.co.uk and via the TrainBrave campaign to raise awareness of RED-S. However, once male cyclists at risk of RED-S have been identified, there are currently no clear guidelines on how to effectively manage such athletes.2 Therefore the purpose of this study was to investigate the efficacy of an educational intervention, specific to competitive cyclists, to ensure adequate energy availability, bone health and performance over the duration of a race season. Forty-five adult male competitive cyclists (equivalent to British Cycling [BC] category 2 or above) who had participated in data collection early in the road race season3 returned at the end of the racing season during September and October. In the early race season, cyclists were matched, in pairs, based on Z-scores for lumbar spine BMD. One member of each pair was randomly allocated to receive educational interventions from the lead clinician. Technicians performing the dual-energy X-ray absorptiometry (DXA) scans were blinded to the allocation. The nutritional advice (see online supplementary file 3) aimed to maintain adequate energy availability, with recommendations for general nutrition and fuelling around training sessions. These recommendations had been approved by registered clinical sports dietitians. The skeletal loading exercises (see online supplementary file 2) were designed to be practical, based on current recommendations to improve bone health,8 with input from qualified Pilates teachers and physiotherapists working with cyclists. For cyclists in the intervention group, both the nutrition and exercise recommendations were fully explained and written sheets provided. Online resources included the sheets and a video demonstrating the exercises. Initially weekly, then monthly, these cyclists were contacted to check on progress. All cyclists were asked to record any sustained changes in off-bike exercise and nutrition, both baseline and fuelling around training. The clinical assessment of energy availability by SEAQ-I made in our published baseline early race season study3 was significantly associated with lumbar spine BMD Z-score in this group of cyclists. We used a similar approach to devise a follow-up SEAQ-I with input from the same clinical sports endocrinologist, sports research scientist, registered clinical sports dietitians, cyclists and coaches for validation of content (see online supplementary file 1). Cycling training, race results and quantification of any changes in skeletal loading exercises performed, as per recommendations, or otherwise. Nutritional information: any changes in baseline nutrition, fuelling around training, as per recommendations, or otherwise; intention to change body weight/composition; addition of any supplements. Medical history during study period: number, nature and site of injuries; number of days off training due to illness. From the follow-up SEAQ-I, cyclists were assessed in each of the areas of nutrition and skeletal loading as implementing either positive change, no change or negative change. Qualitative information was gathered on reasons for cyclists being unable to adhere to the recommendations for their allocated group. Cyclists recorded the number of BC race points won during the study period, together with any race highlights. The number of points won was verified from the BC website. For those competing outside of BC races (eg, Commonwealth Games, European Championships and time trial events), an equivalent number of BC points was estimated, to reflect race performance over the season. 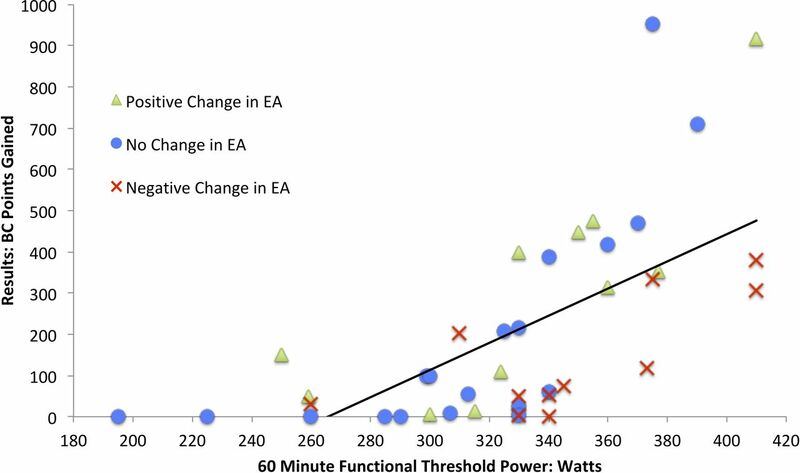 Cyclists also reported their 60 minute functional threshold power (FTP) in watts. Endocrine and metabolic markers were assessed from capillary blood samples taken in the morning after waking to minimise diurnal variation. Samples were analysed to determine concentrations of total testosterone, vitamin D (25-hydroxy), free triiodothyronine, albumin, calcium, corrected calcium and alkaline phosphatase at Surrey University-accredited laboratories using cobas 8000 analyser with interassay coefficient of variation from <2% to 7% for the markers above. Absolute mean values with SD were determined and results were also expressed as Z-scores, using population mean and SD derived from the definition of the reference range, as covering 95% of a normal distribution. Analyses were performed using open source packages Orange12 (Bioinformatics Lab at the University of Ljubljana, Slovenia) and SciPy (Enthought, Austin, Texas, USA). The data set included categorical and continuous observations, taken from the follow-up SEAQ-I, blood markers and DXA results. The means and SD of continuous variables were evaluated and, where relevant, compared against appropriate population reference ranges. Explanatory analyses identified attributes associated with target variables relating to changes in bone health and to cycling performance over the racing season. Since experimental interventions were designed to benefit lumbar spine, the change in lumbar BMD was the target variable for bone health. The target variable for cycling performance was the number of BC points attained. In accordance with the ISCD recommendations,13 the precision error of DXA measurements was taken into account in assessing changes in BMD. A change in BMD of an individual was considered to be meaningful if exceeding the least significant change (LSC), defined as 2.77 times precision error.9 Thus the LSC for lumbar spine BMD was 1.1%. Changes were considered only for those of the original 50 participants who attended the second round of DXA scans and provided a second set of blood results. The resulting set of paired samples was analysed using the paired sample t-test, after checking for normality using the D’Agostino and Pearson test. The equivalence of means of multiple subgroups was tested by analysis of variance. The significance of the regression coefficients between continuous variables was based on the t-statistic. The research, clinical and support pathways for male athletes at risk of RED-S are lacking compared with provision for female athletes. During a pilot study of cyclists, these issues were discussed as SEAQ-I was trialled and refined. Male cyclists were instrumental in the initiation of this current study through involvement of coaches, and recruitment of team-mates and riders from other teams. A male cyclist in this study diagnosed with osteoporosis due to RED-S wrote a patient voice piece for British Journal of Sports Medicine. Other cyclists from the study experiencing consequences of RED-S contributed to articles in cycling magazines and to the TrainBrave campaign to raise awareness. Cyclists and coaches are supportive of and providing input for an educational website on RED-S (www.Health4Performance.co.uk) backed by the British Association of Sport and Exercise Medicine, which has been developed by the authors of this study. Of the original 50 cyclists, 45 participants returned for follow-up. Descriptive characteristics are shown in table 1. Although the study design randomly allocated half the athletes to receive educational recommendations, it became apparent during the follow-up SEAQ-I that participants from both groups had followed nutritional and exercise behaviours that deviated from their allocation in the research protocol. Based on the clinical assessment from the follow-up SEAQ-I, athletes were classified in terms of their nutrition and exercise behaviours. From the follow-up SEAQ-I, the resultant groupings for changes in energy availability were classified as negative (n=11), no change (n=22) or positive (n=12), and for skeletal loading exercise as negative (n=12), no change (n=16) or positive (n=17). 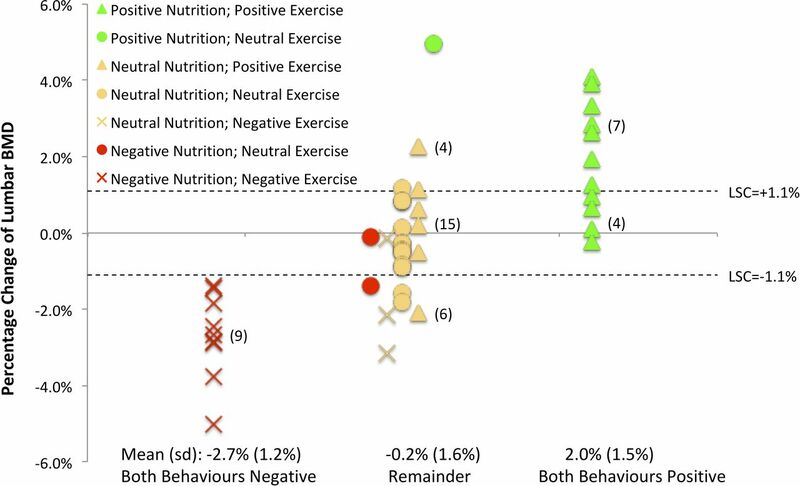 A positive correlation was observed between the nutrition and exercise behaviours (r=0.78), with change or no change in these behaviours tending to occur together. Psychological factors were important in certain subgroups. The 11 cyclists who made positive changes in both behaviours reported improved well-being and feeling stronger on the bike. The 13 cyclists who made no behavioural changes included 3 riders, initially in chronic low energy availability, who had been allocated to intervention. These three were unable to sustain the protocol, citing psychological rather than physical barriers, such as stress during the race season and difficulty deviating from their established training and nutrition schedules. No cyclists had been advised to reduce either nutrition intake or reduce off-bike exercise. Nevertheless, nine riders were assessed as having reduced both. The clinical interview revealed that these behaviours were pursued in the belief that performance would improve. However, these cyclists reported fatigue, illness and injury. For the study group as a whole, BMD was lowest at the lumbar spine (Z-score −0.91). Behavioural group was the factor most closely associated with change in BMD at this skeletal site. Table 2 shows the mean change in lumbar BMD according to the subgroups defined in terms of change in energy availability or skeletal loading. Shown in the bottom row of this matrix, cyclists who had reduced energy availability saw a significant average 2.3% reduction in lumbar BMD over the 6-month interval between scans, compared with a significant 2.2% increase in lumbar BMD for those who had improved energy availability and little change for those with consistent energy availability. The difference between the energy availability groups was highly significant (p<0.001). In the far right column of the matrix, cyclists who had increased skeletal loading saw a significant average 1.4% increase in lumbar BMD, compared with a significant 2.5% decrease in lumbar BMD for those who had reduced skeletal loading and no change for those maintaining pre-existing exercise regimens. The difference between skeletal loading groups was highly significant (p<0.001). Although the association between changes in lumbar BMD with changes in energy availability was slightly higher than with changes in skeletal loading, it was difficult to distinguish between the two factors due to the high correlation between the subgroups. Nevertheless, an increase in both energy availability and skeletal loading led to a markedly better outcome than doing the opposite (p<0.001). Figure 1 shows the change in lumbar spine BMD for the individual cyclists, grouped according to changes in behaviours. The colours refer to nutrition and the shapes signify skeletal loading. Significant increases in BMD (exceeding LSC) were found in 7 of the 11 cyclists implementing positive changes in both behaviours (green triangles). Conversely, all nine in the group who implemented negative changes in both behaviours (red crosses) showed significant reductions in BMD. In the remainder of the cyclists, three of four who had positively changed one of the behaviours showed significantly increased BMD, whereas four of six who had negatively changed one of the behaviours exhibited significantly decreased BMD. Change in BMD for individual cyclists according to behaviours. BMD, bone mineral density; LSC, least significant change. Endocrine and metabolic biomarkers are found in table 3. A significant increase was seen in vitamin D concentration. Although this could have been due to exposure to sunshine over the summer, the increase was better explained statistically by the increase in the number of cyclists taking sports informed vitamin D supplement of 1000 IU per day, recommended to participants who were not already doing so, based on the low readings in the early season analysis. A significant increase in free triiodothyronine was found. The mean concentration of testosterone remained in the lower half of the reference range. No meaningful, statistically significant relationships were observed between changes in biomarkers and the energy availability and skeletal loading behavioural subgroups. One cyclist had been signed for a world tour team, three cyclists gained an elite racing licence, and four riders moved up from the second to the first BC category. Two riders had stopped racing, while the remainder retained their race category. The factors most closely associated with performance, assessed by BC points gained over the racing season, were measures of power (FTP and FTP/kg) and training (weekly training load). Figure 2 shows a significant positive correlation (p<0.001) between BC points and 60 minute FTP. The green triangles are cyclists who improved their energy availability, the red crosses represent those who reduced their energy availability, and the blue circles did not change their energy availability over the period. Graph of cycle performance. BC, British Cycling; EA, energy availability. The majority of those with improved energy availability lay above the line of best fit, whereas most of those with reduced energy availability fell below. A simple two-factor ordinary least squares model of BC points displayed significant t-statistics on the regression coefficients of FTP (3.49, p<0.001) and energy availability (95.0, p=0.015). This suggested that improving energy availability was worth 95 BC points, whereas restricting nutrition cost 95 BC points. Over a 6-month race season, positive, cycling-specific, nutritional and skeletal loading improved bone health and performance of competitive male road cyclists at risk of RED-S. Conversely negative changes in energy availability and skeletal loading behaviours corresponded with clinically significant reductions in both bone health and cycling performance. Fear of negatively impacting performance may create a barrier to implementing positive behavioural changes. A clinically significant increase in lumbar spine BMD was found in cyclists who implemented the recommended strategies. This underlines the priority of addressing low energy availability in RED-S2 and concurs with superior bone health reported in cyclists performing off-bike resistance training.15 The novel finding in this study is that the combination of cycling-specific, practical, integrated nutritional and skeletal loading measures is effective over a race season in improving the bone health of cyclists. Those cyclists intentionally restricting dietary intake reported the reason was an attempt to reduce body weight for the race season, in the belief that this would improve race results. Nevertheless, this did not have the desired outcome as fatigue, illness and injury (including fracture) were reported. After accounting for FTP, those restricting energy availability accrued 95 fewer BC points over the season. This demonstrates that competitive cyclists reach a point where attempts to become even leaner lead to adverse outcomes in both health and performance. For those cyclists who did not change either nutrition or off-bike exercise, there was no significant change in lumbar spine BMD, and performance results were more closely correlated with FTP. Although adherence to change and to no change in behaviours was self-reported, discussion at individual clinical interview provided the opportunity to explore the reasons behind any challenges encountered. Cyclists have multiple risk factors for developing RED-S. We found strong statistical evidence showing changes in energy availability and skeletal loading exercise were positively correlated with clinically significant change in lumbar spine BMD over a 6-month cycle race season. Synergist effects of changes in the combination of both activities were reflected in the greatest improvement or deterioration of lumbar BMD. Furthermore, after accounting for FTP, changes in energy availability resulted in ±95 BC points over a race season. This study found that fear of negatively impacting performance prevented some cyclists from implementing behavioural changes to address RED-S. It is hoped that these statistical results might help athletes at risk of developing the consequences of low energy availability overcome the psychological barriers to make the behavioural changes required to improve their health and performance. Thank you to all the cyclists and coaches for their interest and participation in this study. Many thanks to Sophie Killer and Renne McGregor for comments on sports performance nutrition. Thanks to Jamie Francis for his input on cycling aspects in study design and comments on the manuscript, and to Brian Oldroyd for scanning of cyclists and comments on the manuscript.
. Relative energy deficiency in sport (RED-S) clinical assessment tool (cat). Br J Sports Med2015.
. Interpretation of dual-energy X-ray Absorptiometry-Derived body composition change in athletes: a review and recommendations for best practice. J Clin Densitom2018.
. Orange: data mining Toolbox in python. J Mach Learn Res2013;14:2349–53.
. Total energy expenditure in elite open-water swimmers. Applied Physiology, Nutrition and Metabolism2018:1–3. Collaborators Brian Oldroyd, Leeds Beckett University, Leeds, UK. Contributors NK: conceptualisation of the project, development of study design, research funding application, involvement of cyclists, their coaches and sports performance dietitians, conducting clinical sport-specific interviews, drafting and revision of the manuscript. GF: cycling-specific advanced statistical analysis, drafting and revision of the manuscript. KH: development of study design, research funding application, scanning of cyclists and revision of the manuscript. IE: scanning of cyclists and comments on the manuscript. Funding This study was supported by funding from the British Association of Sport and Exercise Medicine (BASEM) and by SunVit-D3 for the analysis of endocrine and metabolic markers. Ethics approval This study was reviewed and approved by Leeds Beckett University research ethics committee. Data sharing statement No unpublished data were used in the preparation of this manuscript.